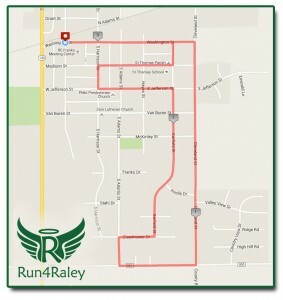 We just wanted to send out a few reminders about Run4Raley on Friday. If you are coming into town from the North, follow the signs along 130 (turning at Casey’s) that will lead you to our parking location, which is by the grain elevators near Washington Street (Main Street). We will have volunteers in place to help you park. If you live in Philo, you’ll need to park at the same location but will only have access to do so until 6:30. After 6:30, you’ll also need to enter from the North side of the tracks. We’ve included the course map here as well. Registration will be at the Franks Center, which is on Washington Street (Main Street). It’s across from the Philo Post Office. At 6:00pm, registration opens. That will also be when our inflatable & face painting open. Kona Ice will also be there then as well (but will not be free). Can’t wait to see you all on Friday! !